When friends ask me about looking after their clothes, it always strikes me that their questions come too late. They’ve trodden down the heel cup of a shoe, and want to know if it can be repaired; a suit is looking old and grimy and they want a good dry cleaner. Looking after clothes is about pre-empting such problems. Small things every day (or as often as you can) make a big difference. The most obvious area is shoes. 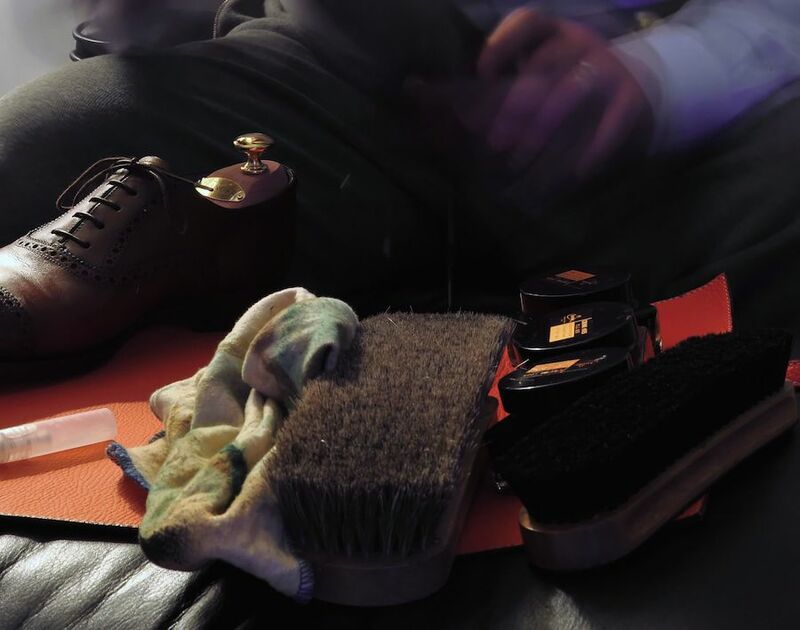 So few men brush their shoes at the end of the day, yet it actually saves work if you want them to look good. Brushing removes the little scuffs acquired through daily wear, and means you don’t have to polish them as often. Using a shoe horn, of course, stops you bending over the leather around the heel cup, which will eventually split and break. Shoe factories all say that is the most common repair they have to make. Shoe trees retain the shape of the upper; a little cream every month or so stops them drying out. All small things, but with big results. And frankly, if you’re buying any of the shoes we mention here on Permanent Style, which will cost between £500 and £4000, it’s nothing more than intelligent to invest time as well as money. Brushing suits is a hard one. I often find it a chore, but I try to keep it up because I know the vast majority of dirt is atmospheric – just settling on the shoulders and lapels and in need of a quick brush off at the end of the day. Shirts are the hardest garment to maintain. Stains will happen, and it’s one reason I’d always recommend spending less on them proportionately than suits or shoes. Hanging suits up; giving them plenty of room in the cupboard; hanging your ties and folding your knitwear. It’s not too much to say that 90% of looking after clothes is just daily good practice. Stick with it, and feel smug later. You can follow the discussion on Little things every day: How to maintain clothing by entering your email address in the box below. You will then receive an email every time a new comment is added. These will also contain a link to a page where you can stop the alerts, and remove all of your related data from the site. The one I don’t ‘get’ is the shoe tree one. I have been buying nice shoes for at least 10 years now, and don’t own a pair of shoe trees. I really don’t get what they do? I put my shoes back in the box, or under the bed, when the day is over – I need someone to explain what inserting a shoe tree will aid?! It stops hard creases forming in the upper, where you bend it as you walk. These creases often don’t look good, and they are the first point the upper will crack in the long term. It becomes harder to get cream or polish in there too. The shoe trees also help retain the shape of the shoe elsewhere, as your foot distorts it slightly over time. When I put my shoes away I just stick an old rolled up sock or something similar in the front to push out those creases. Timely post Simon. I have a couple of Neapolitan cashmere jackets which I always brush and hang after wear, but which could now probably do with a careful cleaning. Is there someone you could recommend in central London for such garments? I see from one of your earlier posts that you have been pleased with Press2Dress, who could be a good option if I used their collection service. Many thanks. Do you still use P. A. Crowe for there valeting service? Simon, on a slightly different topic. Can you tell me if polyester is ever justifiable in clothing or should we religiously stick to cotton and wool? It’s just that I was accompanying someone to Zara (yes , please do forgive me !) and nearly everything I picked up was 90% polyester. The visit itself was an eye opener as I saw women queuing, not only to try on this rubbish, but then to pay for it . I’ve certainly changed my views through reading your blog over the years and appreciate why a £200 plus pair of shoes is a reasonable price compared to Jones (a retailer who’ve really let go of their standards ) discounted shoes that quite frankly look so bad you wonder why anyone ever bothers to ask for the other shoe to try the pair on together. Synthetic fabrics can be justified in a few case – eg for weather resistance, to help wear (sometimes in socks) and very occasionally for stretch. But generally no, always go for 100% wool. It will breathe better, hang better and just look better. In fact wool is such a great material for tailoring and its virtues are rarely praised highly enough. I read somewhere that rolling ties up is preferable to hanging as the residual heat from ones body helps smooth out any creases and also makes them easier to store. Anyone else heard this? Or do I need to replace my tie drawer with a dozen-or-so tie racks and a coupe of feet of valuable wardrobe real estate? Rolling is a good fallback option and is preferred sometimes for materials (eg wool) that can stretch over time if hung. But a tie will always recover its shape better if it is hung, and none of my wool ones have stretched through doing so. Here’s to these helpful/easy tips for clothing care and a dash of smugness later on. My first ever bespoke suit was a light grey pick and pick. I spilled coffee on the trs leg and was told by (the Queen’s cleaners) Lilliman & Cox that there was nothing they could do. My suit was a write-off. Only, they were wrong. I went home and cleaned it myself. I spot clean everything myself these days on my tailoring. A damp cloth with a tiny bit of handsoap, washing-up liquid etc will easily wipe away a small stain and save you subjecting the whole suit to chemical ruination. Just remove any excess soap, pat it dry and press afterwards. Many marks will simply brush off so always try that first. Don’t be afraid of putting a little water on wool. I’m a tailor. I use plenty of water while making the garments! Do you really think shoe cream is worth it? I always brush shoes between wearing them (not always at the end of the day sometimes just before wearing them again). They are always stored on trees and I regularly use polish. I have never quite seen the point of cream. Cream is worth it, but you don’t need it that often. Every month or two depending on wear. Cream feeds the leather, keeps it supple and stops it cracking in the long term. Polish feeds the leather a little, but not in the same way or to the same extent. Simon, this is one of your best practical articles that all of your readers should read carefully. Of course I always fold my wool knitwear,but wonder if one should fold sea island cotton knit wear as well or if putting it on a hanger is acceptable? For example, I have a Smedley sea island polo, the Finchley, that I’ve kept on a hanger, please advise. Also, would you recommend taking a Smedley sea island cotton garment to the cleaners for laundering or is washing it in a home washing machine satisfactory? Fold the sea island knitwear too – it could stretch on a hanger. I find that hand washing Smedley sea island garments keeps the garment in best shape. Lay flat and don’t iron. Simon I know you occasionally wear Wolverine boots. Do you use a special cream for the chromexel leather? I’ve tried Venetian (ok results, dirt cheap) and renovatuer from Saphir (smells better, more oily). Any other good suggestions? Thanks for the reply Simon. I will give that a go. I can recommend a good book for keeping clothing clean. It’s titled “Field Guide to Stains; How to Identify and Remove Virtually Every Stain Known to Man.” Authors are Virginia Friedman, Melissa Wagner, and Nancy Armstrong. It’s currently available from Amazon, cost is $12.24 (USD). It’s geared to do-it-yourself at home. But if you spill something on a dry-clean-only garment, my contacts in the best local dry cleaner tell me that it’s best simply to blot any excess fluid or whatever, then get it to the cleaner as soon as possible, point out the stain, tell the counter person what it is, and let them take care of it. Sometimes people try to get the stain out themselves and end up making the problem worse. Kudos to the tailor who rescued his own suit — but not everyone has the skills to do so! Thanks again, Simon, for all the information you give us — I’ve suggested this site to several of my alterations customers. My favourite for getting out stains has been the Wash and Stain Bar by the Laundress. I believe Kirby sells them over at the hanger project. Its a small square bar of soap that’s pretty good at getting out most stains and gets good reviews mostly. Very good article on an often-neglected aspect of menswear. I’ve used Press2Dress several times (after reading about them on PS) and can highly recommend them. Owner Michael Norman is very friendly and knows everything about looking after fine clothes. They do a bespoke dry-cleaning service for your most prized suits. This is a manually controlled, individual wash and press. I recently took in my Graham Browne suit that had picked up some nasty marks during the – ahem – hazy latter stages of a wedding and it came back good as new. The standard dry-cleaning is excellent too. Michael also did a lovely job re-pressing one of my wife’s dress which had been badly done by a lesser service. She was very happy with the results. Good advice. One thing, however, is to find someone for pressing jackets and suits in London, the home of bespoke. What advice would you give to someone living where the dry-cleaners hardly are used to that level of craft? Sigurd, they are very hard to find even in London – hence the best recommendation here is a service from a suburb out of London who drives in (Press2Dress). Any thoughts on what to do when the suit needs a good press Simon? I wore a jacket which was admittedly ‘inappropriately’ too heavy at a party, and much body heat later after several hours, as a result I can feel the canvas may have a puckered a little at the shoulder area, causing some minor vertical striations under the jacket cloth. Can the inner canvas be pressed flat again?! The canvas can’t be pressed separately without taking it apart, but that might not be necessary. I’ll do something separately on pressing a suit. You can do this yourself or – for anything complicated like it sounds you have, you will need someone else to press it. This is the biggest problem with dry cleaners really – not the cleaning quality but the lack of good hand pressing. Yes I envisaged it would probably be a specialist job required, so have left it and will probably take it to a tailor for pressing at some point. It would be great if there were a valet service founded by people in the trade where you could take any bespoke garment, not just those from that house, for such things as ironing/steaming, or reworking, but it seems not. I don’t trust dry cleaners at this level of bespoke, I can’t afford the risk of things not working out. What is a shoe cream that you recommend? Hi Simon, really useful and informative post. Are there particular brand or type of brushes that you would recommend for suits? No, they don’t have to be that specific. Any clothes brush should be fine. Shoe trees – I consider them an absolute must but I think some ambiguity exists as to their actual purpose. You suggest that they help prevent deep creases forming. Elsewhere it is insisted that their main purpose is to help to wick sweat away after use (hence why wooden trees are best) or that they should be used to prevent the front end of the shoe from bending upwards and creating an unsightly bow. I’ve yet to hear any conclusive reason why wooden trees would absorb sweat better than air would evaporate it, but for preserving the overall shape of shoes and the integrity of the leather there are essential. Leather is a pliable natural product that will deform over time and trees provide a mould (or last I suppose) for them to conform to when not in use. You could say that your feet also serve this function but a) you likely aren’t wearing a pair most of the time and b) they are bent, stressed, warmed up and perspired into while worn. They settle down after wear. They are also good for wicking away moisture, although air might be slightly better for the first few hours. Listen to Simon’s advice. When the shoes have cooled down and dried out it’s too late to insert the shoe trees. Air may dry the shoe but it won’t smooth the creases out. In the manufacture of shoes, you take a piece of flat leather and then use heat or moisture to mould or shape the leather. Heat or moisture make leather pliable. Your shoes are both warm and moist when you take them off. That’s the moment for the trees. Wooden shoe trees are undisputed amongst the experts who make the shoes. It’s an extra cost but its a wise investment. Can you advise on brushes for suits? Also, why hang ties and how best to manage that? This is answered a bit in other comments above…. How do you prevent clothes moths from infesting your clothes? Big question. The key thing to watch for is clothes that are in storage or not being used. Those need to be cleaned, put in bags and then sprayed on the outside with a scent or moth killer. Cedar is a good moth repellent. Hang some strips in your wardrobe, and also place some in the drawers to keep your sweaters etc moth free. The best way to store clothes are as follows. 1 Use breathable suit or garments bag not plastic so the material can breathe. 2 Always hang on a appropriate hanger if its a suit/jacket bulbous shape. 3 Stuff sleeves with acid free tissue paper to retain shape. 4 Orphea moth repellent strips to keep the pests away from natural fabrics. 5 Most importantly and always overlooked,never store or put away clothes that has any stains/marks on them as this can permanently damage the fabric. Have you any advice regarding prevention of yellow strains on the underarm of your shirts/underwear? I’m not sure if it is due to deodorant or perspiration. I was wondering how often you dry clean your shirts to avoid the build up of discolour in the shirt collar etc. which a normal washing machine won’t remove? Do you have any regimen or tips in this regard? For underarm stains on shirts try Deo Go which I’ve bought from Amazon – only thing that works properly on yellowing, caked-in deodorant stains. Read the instructions carefully though as it’s an acid -it damages metalwork and may cause issues with some coloured cloths. . Very useful article. I have found that putting on clinical strength deodorant the night before (it also does not wash off after a shower the next morning) helps prevent underarm stains. Secondly, wearing cotton undershirts, with short sleeves, helps prevent any eventual stains from transferring to the much more expensive shirt. I also find that wearing an undershirt gives a dress shirt more ” body” and looks smarter. V- neck undershirts can also be worn when a tie is not worn. I have a small hole (1cm) in the crotch of a suit trouser. Do you have any advice that I should take to my alteration tailor? No, but if it’s a hole rather than a split then you’ll likely need an invisible mender – not cheaper but cheaper than a new pair of trousers! That would be kind and nice. But I live in Stockholm. the cloth of a much-loved bespoke navy suit is starting to develop a sheen. Can anything be done to alleviate this? Going forward, can I adopt any additional care measures to prevent cloth from becoming shiny? Kyrill – if it’s not too severe that might be worth trying. Don’t hold out hope for getting them back to new though! Many thanks Simon and Michael! Alas, I am not based in London but would try to approach local cleaners for a brush & steam treatment. I have problem with yellow stains on my shirts. I have switched to aluminium-free deodorant to avoid it under my arms. But the problem still occur on the collar. I dont really understand what it comes from and its nearly impossible to laundry. Do you have any tips? Spot removal is a particular concern of mine. I dred staining a pair of flannels, actually anything. Wine, coffee, different food products, blood…………not to mentionthe different fabrics affected by these. Can you offer what you have discovered as solutions to this problem, keeping in mind the source of stain and fabric involved. Hi Guy. That’s a big area. In general, my advice would be to simply soak up what you can (eg with napkin or kitchen roll), leave to dry naturally, and take to a good dry cleaner.